There continues to be mixed economic data coming out of the U.S. For example, while manufacturing survey data remain soft and the jobs report released at the beginning of May came in below consensus forecasts, retail sales have been relatively strong and the growth in new home sales has been stellar. 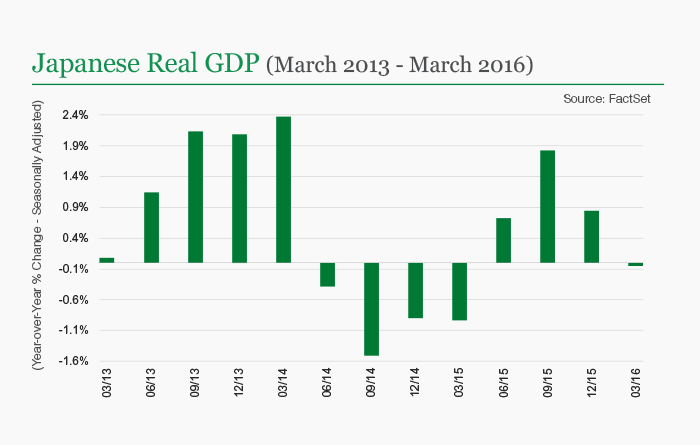 The second estimate of growth in first quarter 2016 gross domestic product (GDP) was revised upward, but only to a 0.8% seasonally-adjusted annual rate (the initial estimate was 0.5%). The latest GDP release also included the first official estimate of U.S. corporate profits during the first quarter. Although they grew by 0.3% quarter-over-quarter—a reversal of the previous two quarters of negative growth—profits still decreased 5.8% year-over-year. We continue to regard the sometimes-conflicting economic data as an indication that the economy will remain on its slow-growth trajectory. Nevertheless, while we don’t see any noteworthy catalysts on the horizon that would drive growth materially higher or lower, on balance the more recent data suggest the economy might be more likely to surprise to the downside than the upside. 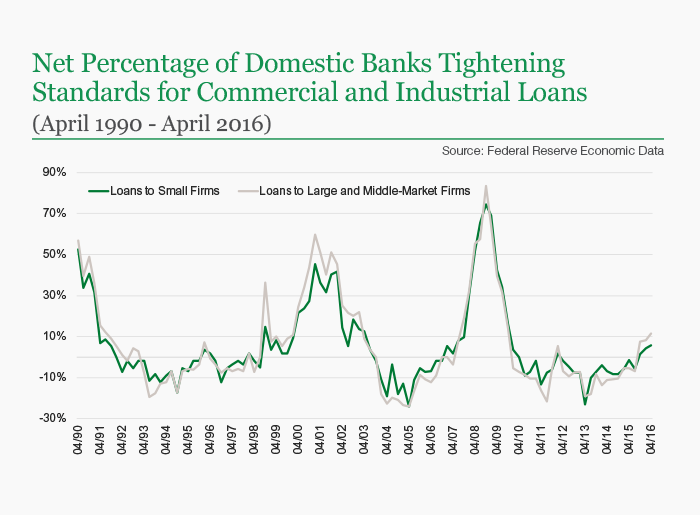 In thinking about potential headwinds to the U.S. economy, the chart below shows that U.S. lenders have been tightening lending standards. Some firms in the energy sector certainly have had their access to credit curtailed, but the tightening could spill into sectors outside of energy and be a drag on U.S. investment. 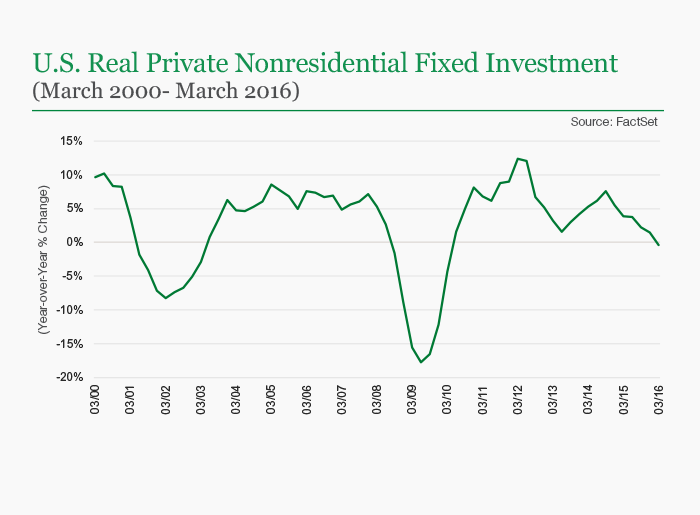 Sticking with investment, the year-over-year growth rate of private sector capital expenditures has been steadily declining since the end of the third quarter 2014. This decline is connected to the rise in share buybacks during recent years, as a lack of attractive investment opportunities has led companies to use their cash to purchase their own stock. However, now that the general election campaign for president has started to coalesce, this decline also is one reason why there has been talk of fiscal stimulus in the next administration, regardless of who wins the election. The argument is that it would provide new momentum for the economy in the absence of capital spending by businesses. New infrastructure investments are often highlighted as being an integral part of any stimulus package, as it is not a controversial position that the U.S. is in need of updated infrastructure. A much needed transportation bill passed by Congress last December and signed by President Obama provided some indication of the bipartisan recognition of the need for infrastructure upgrades. This is a topic to keep an eye on as the campaign unfolds. Regarding the likelihood of the Federal Reserve raising the federal funds rate at its June meeting, the mixed economic data have also created a lack of clarity about whether the existing environment warrants a rate hike. The bond market has been signaling that the chances of another hike this year have increased, but there is evidence that monetary conditions have already tightened more than the hike of 25 basis points in December would imply, largely the result of a stronger U.S. dollar. In Brazil, the Senate voted to hold an impeachment trial for President Dilma Rousseff, handing her another setback after she lost an impeachment vote in the lower house of Congress in April. Vice President Michel Temer has assumed the presidency for the duration of the trial, and would finish Rousseff’s term that runs through 2018 if the Senate convicts her. From an investment perspective, Brazil beginning to move past Rousseff’s presidency is certainly a positive, if for no other reason than her main goal lately seemed to have been staying in power at all costs instead of governing the country and taking the hard steps needed to return foreign investor confidence to Brazil. If Temer’s administration is successful in uniting Congress behind an agenda that focuses on reforming the fiscal situation, making the economy more market-driven instead of interventionist, and tackling the stubborn corruption issues inherent in Brazilian politics, Brazilian assets could continue their recent successful run. Absent these meaningful steps, however, we believe Brazil will remain vulnerable to just being a proxy for global commodity prices, as without the above fundamental reforms, the secular investment case would not change all that much. In Japan, Prime Minister Shinzo Abe appears set to delay a sales tax hike planned for 2017 until 2019. Abe apparently has been concerned that the hike could make it harder to combat Japan’s problem of persistently low inflation. A previous sales tax hike, in April 2014, had a clear negative effect on growth. This move does not surprise us, as we have believed there was a greater likelihood that Tokyo would further ease fiscal and monetary policy than incrementally tighten the screws on the economy. In fact, Abe also appears ready to provide a new round of economic stimulus. One potential vehicle Japan could use is so-called “helicopter money,” which is an idea that lately has been gaining traction in policy circles. In this scenario, the government would give cash directly to individuals in order to spur demand and inflation. It has been our opinion that Japan would be the first government to experiment with such a plan, and the probability of it happening appears to be increasing. We believe markets would likely cheer the onset of “helicopter money” in Japan, but we would not view it in a positive light. We see the stubborn deflationary environment as a consequence of demographics and a lack of structural reform. In India, the parliament passed a national bankruptcy law that reforms the country’s code and is designed to make India a more business-friendly environment. The new legislation should make it easier to deal with accumulating bad debts at state banks. Absent a national bankruptcy law, it has been difficult for banks to recover their debts from insolvent companies, with negotiations often turning into protracted legal battles. This possibility in the bill’s aftermath should provide a boost to investor confidence. The bill’s passage also was a win for Prime Minister Narendra Modi, as it could help to revive his government’s stalled reform agenda. We see the bill as a significant plus for India, and another piece of evidence that supports our view of the country. The legislation joins the list of incrementally positive reforms that in aggregate should have a constructive impact on the business environment. In a world largely devoid of growth, India is a growing economy with favorable demographics, an under-penetrated consumer segment, and an increasingly-favorable business environment. Global equity markets generated positive absolute returns during May on a local-currency basis, but were flat on a U.S.-dollar basis. U.S. equity markets also delivered positive absolute returns. Valuations in the broad U.S. stock market remain somewhat elevated, but we continue to see little evidence of excesses in the market or economy that would need to be unwound. In this environment, discernment and flexibility are critical. For fixed income investors and investors with a shorter time horizon or current income needs, we still see value in the corporate bond sector, but remain mindful that it is in the later part of its economic cycle and is no longer especially cheap. Regarding government debt, our portfolios have a sizeable allocation to Treasury Inflation-Protected Securities (TIPS). We also recently increased intermediate-term nominal Treasury exposure in some portfolios to diversify sector allocation and yield curve positioning, but our short duration positioning has not materially changed. We believe this remains in clients’ best interests because investors are still not being paid to take on significantly higher levels of interest rate risk. In our view, short-term and income-oriented investors should also explore equities that display stable fundamentals and are trading at attractive valuations. We believe companies that generate strong, stable cash flows and pay an attractive dividend could be compelling options for these types of investors in the current environment. Sources: FactSet and Federal Reserve Economic Data. Analysis: Manning & Napier Advisors, LLC (Manning & Napier).